The gas turbine has seen a recent and meteoric rise in popularity within the power generation industry. Until the end of the 1960s gas turbines were almost exclusively the preserve of the aviation industry. During the 1970s and 1980s they started to find favour as standby and peak power units because of their facility for rapid start-up. It was during the 1990s, however, that they became established, so that by the end of the twentieth century the gas turbine had become one of the most widely used prime movers for new power generation applications - both base load and demand following - virtually everywhere. It has been suggested that gas turbines could account, for example, for 90% of new capacity in the USA in the next few years. A number of factors contributed to this change of fashion. Deregulation of gas supplies, particularly in the Europe and the USA, and the rapid expansion of natural gas networks have increased the availability of gas while conspiring to keep prices of natural gas low. More and more stringent emission-control regulations have pushed up the cost of coal-fired power plants making relatively pollutant-free natural gas look more attractive. Power sector deregulation has also contributed, by attracting a new type of generating company seeking quick returns. Gas-turbine-based power stations can be built and commissioned extremely rapidly because they are based around standardised and often packaged units and the capital cost of gas turbines has fallen steadily, making then economically attractive to these companies. The most potent factor, however, has been the development of the combined cycle power plant. 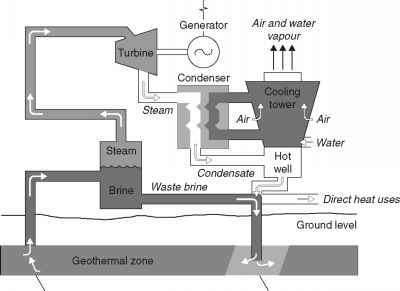 This configuration, which combines gas and steam turbines in a single power station, can provide a cheap, high-capacity, high-efficiency power generation unit with low environmental emissions. With net conversion efficiencies of the largest plants now around 50%, and with manufacturers claiming potential efficiencies of 55% or more in plants incorporating their latest machines, the combined cycle plant offers power generating companies a product that seems to promise the best of economic and environmental performance that technology can currently offer. This unrestrained popularity has occasionally led power generating companies into difficulties. In the UK, for example, there was a significant move towards gas-fired combined cycle power plants during the 1990s. New market regulations introduced at the end of the decade led to a marked fall in electricity prices and may combined cycle plants could no longer generate power economically. This inconvenient conspiracy of economic factors highlights the main factors in the gas turbine for power generation equation. Gas turbines are cheap but the fuel they burn, normally natural gas, is relatively expensive. The economics of gas-based generation is therefore extremely sensitive to both electricity and to gas prices. Gas turbines can burn other fuels, distillate or coal-bed methane for example. However the modern boom is based on natural gas and it is upon this that their continued progress will rest.